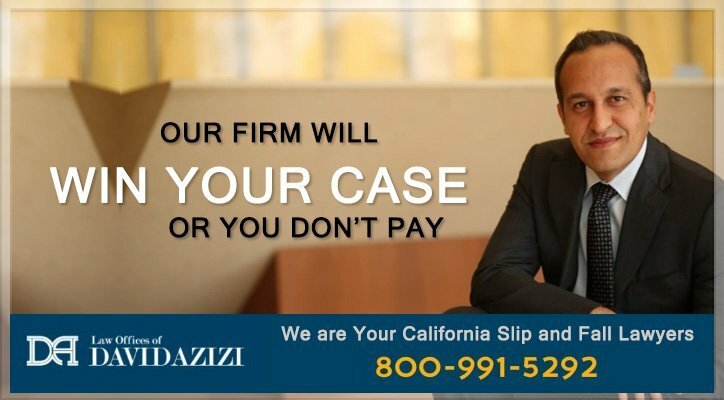 The slip and fall legal team at The Law Offices of David Azizi have defended the rights of many Los Angeles area residents who have suffered slip and fall injuries on public property. David has sought to obtain the compensation his clients need to pay their medical bills, recover lost wages or other damages the incident caused. Call David’s office 24/7, seven days a week to schedule a free, no-obligation case review. David will go over your case, answer your questions and discuss your options going forward. Just call (800) 991-5292 or use our contact us page. David wins 98 percent of his cases. Let’s get started on yours. Have you tripped and fallen on a public sidewalk, slipped inside the post office or fallen after tripping at the county museum? All of the scenarios have one thing in common: they happened on government property. If the accident and subsequent injuries happened due to negligence, you might wonder if you have the right to be compensated for the damages associated with the accident. 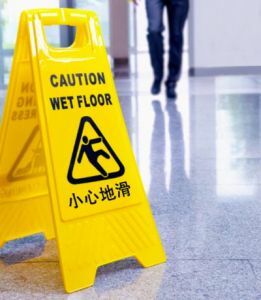 As with commercial and residential trip and fall accidents due to negligence, those that happen on public property are subject to premises liability law. This law governs what happens if you fall at Walmart, at a hotel because of negligence of an ice machince, on a public stairway, or even a local grocery store. However, if the accident happened because a government employee or entity failed to keep the property safe, you can file a claim against the city, county or federal government. There are differences in filing a claim against a government entity, however, and knowing what to do and the time frame in which you must act can affect whether you succeed in collecting damages or not. Get emergency care if needed. Report the accident to the person in charge of the public building or a police officer in the area if it happened outside. Use your cell phone to take a picture of the dangerous condition that caused your fall. Take the picture as soon as you can. Often, a dangerous condition will be removed or repaired quickly after your accident, eliminating the ability to record it. Obtain the name, address and telephone number of witnesses that saw your accident. If others witnessed your injury, but not the accident itself, ask for their contact information also. Some witnesses may frequent the area or building and might have noticed the condition prior to your fall. This is valuable information, and making note of it is important. If possible, ask witnesses to write down what they saw and sign the paper. Look around for video cameras. Most state, local and federal buildings have video cameras. If you fall outdoors, businesses in the area may have security cameras. Ask the owner to see the footage. Having footage that shows your accident can be useful in the future. In addition, some video footage extends over a considerable amount of time. This proves that it did not just happen, and the person/entity in charge should have been aware of it. See your doctor as soon as possible. Medical records link the injury to the accident. This documentation is invaluable in proving that your injury was a direct result of the accident caused by the dangerous condition. When you arrive home, take pictures of any bruises, lacerations or abrasions caused by the accident. Call or live chat 24 hours a day to see how we can help. In order to file a lawsuit against a government entity or recover compensation, you must meet the requirements of the California Tort Claims Act*. Following the lead of The Federal Tort Claims Act (FTCA) of 1946, which allowed citizens injured on federal property or hurt by a federal government employee to file a lawsuit to recover damages, California permits those injured on the city, county or state level to file claims or lawsuits against the government. One requirement is to file a written notice of claim against the government entity. The notice of injury claim is used to advise the government entity that you intend to file a claim for personal injury, death or damage. The government agency has 45 days to respond. If the agency allows the claim, you will be compensated for your injury. If no response, the claim is deemed denied. If the claim is denied within the 45-day period, you can file a lawsuit. The lawsuit must be filed within six (6) months from the date the denial was mailed or personally given to you. If no rejection letter is received, you have two years to file a claim from the date the incident happened. However, it is prudent to assume that you have six months to file. The federal government uses Standard Form – 95 (SF-95) for this purpose, while Los Angeles County** and the City of Los Angeles*** has its own claim of notice form against public entities and government employees. The Law Offices of David Azizi can provide you with their own form. Without filing a claim notice, a lawsuit in the matter will not be allowed to proceed if you are denied. Your claim will not be approved either. Where Do I Send the Notice of Claim? It is imperative that you send the notice to the proper government agency. Sending it to the wrong agency can result in your claim being barred. It is a good idea to call the city or county clerk’s office to find out where to send it. If your claim is against the state of California, you can call the Government Claims Program† for more information. It is a good idea to send a letter to the person with whom you spoke, confirming the address and other instructions you were given and retaining a copy for yourself. Since it is important to prove the form was received within the required time limit, you can either send it return receipt requested or include a copy of the form and a self-addressed, stamped envelope for the clerk to send along with a date of receipt stamp. Signage warning of wet floors prevents accidents. A dangerous condition existed and the entity/party in control of the property knew or should have know about the dangerous condition. The dangerous condition was not repaired or removed. Alternately, the entity/party in control knew about the dangerous condition but did nothing to repair or remove it. The entity/party in control caused the dangerous condition. If you are unsure whether your accident happened on the premises belonging to a business or a government entity such as the City of Los Angeles , there are ways to find out. For example, let’s say you tripped on a damaged sidewalk in front of a convenience store. It may be unclear whether the convenience store was responsible for the sidewalk or if the city was. It may be necessary to go to the tax collector’s office‡ to determine who actually owns it. One of the most frequent questions an attorney is asked is how much is my case worth. That differs from one case to another. The Law Offices of David Azizi provide a slip and fall settlement calculator for just that reason. David will explain that resolving a claim too quickly may result in you not being compensated for all your injuries. Sometimes injuries evolve and it is impossible to know how injured you are in the beginning. If the case is settled too early, additional expenses for these late-developing issues will not be covered. Medical Expenses: This covers any medically-related cost such as emergency room care, ambulance services, hospital costs, including doctor visits to the hospital, medication, doctor office visits and nursing care in the hospital and at home. Lost Income: If you were working when the accident happened, the wages you lost due to the accident are recoverable. Your employer can provide a payroll schedule for confirmation. In the event you cannot return to the same type of work because of your injuries, you may also be compensated for future lost income. Pain and Suffering: These non-tangible losses refer to the mental, emotional and psychological effects of the accident. This also includes chronic pain due to the accident. Ancillary Expenses: Expenses such as gas or taxi fare to go to doctor appointments would be considered an ancillary expense. Head Injuries: Closed head injuries include lacerations to the scalp, skull wounds and fractures. Generally, the skull is difficult to break since it lacks bone marrow. A fracture may lead to brain injury. Brain Injury: Hematomas can occur inside and outside the brain. When it happens outside the brain, it is called a subdural hematoma and can put pressure on the brain. If this pressure increases and is not released, death can occur. Hemorrhage is uncontrolled bleeding. It can occur around the brain where it is called a subarachnoid hemorrhage or within the brain where it is referred to as an intracerebral hemorrhage. Concussion, edema within the brain and sheer injuries to the brain, also called diffuse axonal injury can occur. The latter is one of the most dangerous, and while it does not cause bleeding, it can lead to permanent damage or even death. Fractures: This can include a fracture of any bone, including those of the hip. All fractures can be complex and require surgery. Hip fractures are serious and may necessitate surgery, and in some cases, hip replacement. Dislocated Shoulder or Impingement Syndromes: Both are serious and involve extreme difficulty using the arm and hand. These injuries may require surgery, depending on the level of damage. Spinal injury: This includes damage to the spine itself. Injury to the neck/cervical area, mid-back/thoracic spine or the low back/lumbar spine can result in disc bulging or herniation. This may require surgery such as disc fusion to repair. Ligament damage can cause significant pain, and in the extreme, require surgery if the ligaments are torn. Spinal Cord Injury: This involves damage to the spinal cord itself. Depending on the level of damage, this may result in paresis or weakness or paralysis. Rehabilitation therapy is required. Wrist and Hand Injury: This can include fracture, torn ligaments or nerve damage. The latter two may require surgery. Nerve damage may cause long-standing problems that are not treatable. Facial Injury: This can vary from fracture of the facial bones to dental trauma. Knee Injury: Knee injury can happen when a person falls forward and lands directly on the knee or bends the leg at the knee either to the outside (lateral) or inside (medial) area during the fall. A direct fall may result in a patellar (kneecap) fracture, which can require surgery. Lateral or medial injuries can result in meniscus tears. The menisci are rubbery discs that keep the knee balanced and are torn with a twisting motion. In order to regain knee stability, surgery may be needed. David Azizi has been practicing personal injury law in Los Angeles and the surrounding area for 21 years. He gives his clients not just the empathy and compassion they need, but the skill and experience he has honed during this time. In the end, David wins 98 percent of his cases because of commitment to clients, tenacity in accomplishing just and adequate resolution of their cases and the knowledge of the law he possesses. Several outstanding organizations have acknowledged David’s acumen, including Super Lawyers who call David a top personal injury lawyer in Beverly Hills and Expertise.com who call him one of the top twenty lawyers in Los Angeles. Call David anytime, any day of the week at (800) 991-5292. The Law Offices of David Azizi know accidents don’t happen during regular business hours, and we are here when you need us. David even gives clients his cell phone number because he recognizes they have many questions or just need to talk to him. Take the stress out of dealing with government regulations, and get the compensation you need to pay the bills often associated with a government slip, trip and fall accident. David will do it for you, and if it is necessary to take the matter to court, David will be there. Call us today and set up your free, no obligation consult now.